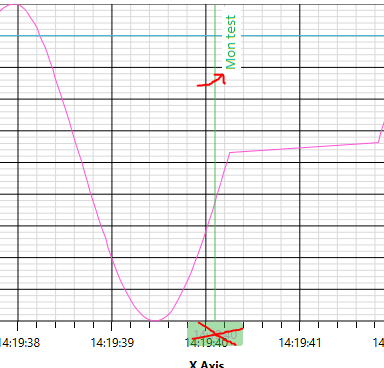 I’m trying to display a vertical line annotation on a chart using MVVM. 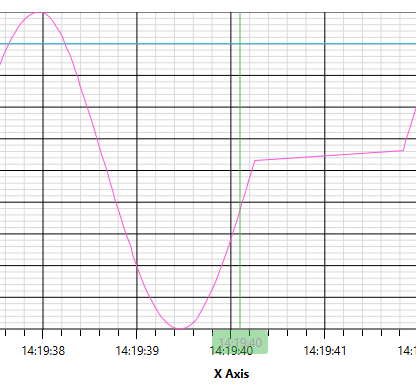 I’ve double check that my x axis and y axis have the same ID as the annotation. The problem is I want to display several annotation labels but they are not appearing. I suspect a problem via the AnnotationsBinding which is not taking the AnnotationLabels from the VerticalLineAnnotationViewModel. AnnotationLabels will not be shown, that’s why I let it. I have successfully added text labels to my charts using ILabelProvider. However, some of the charts are showing duplicate labels for each bar, and others are not showing the labels for all bars (even though there is space to do so). Any idea how to fix these? See the attached images for more details. I have to build a financial chart, and the Y label must be always multiplied by 0.25 , as you can see in the image attached. I didn’t find how to reach this goal in the documentation and in the knowledgebase articles either. I created a very simple project with a single grid and one element which is the scichart. Everything renders normally when the program first starts. If I make the window smaller vertically by dragging, everything continues to render correctly, but when I increase the height of the window by dragging, the vertical axis value label (4000.00) gets clipped if I go about 50 pixels more than the original window height specified. Note: the clipping is all at once, if I go one pixel too far, the labels clip as shown. If I make the window one pixel smaller, they appear normally again. I have recently upgraded to SciChart 3 without major issues, but one thing that has changed is that the labels on my YAxes get cut-off beyond the minimum and maximum value. It’s a really weird behaviour and I have no idea what may be causing it. Please note that I do want to be able to display the ‘0’ label (that was the reason I updated to the newest version of SciChart). I’ve attached some screenshots that illustrate the problem.